Online media company Local Corporation (LOCM-NASDAQ) reported this morning on new market research commissioned from Borrell Associates. Among its services, Borrell works to gauge ad spending in local markets. The company forecasts that the online pay-per-call ad spending sector (also known as “enhanced directory assistance”) could be worth $8.1 billion by 2018, up from a current value of approximately $1.7 billion. Moreover, business use of this form of online advertising is anticipated to more than double by 2018. 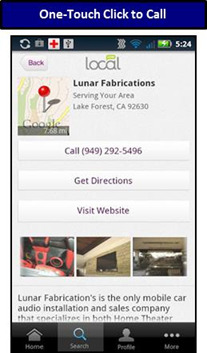 As more and more online searches for local goods and services are being performed on mobile devices (as opposed to on the traditional desktop platform), Local Corp. and other industry experts believe that pay-per-call as a mobile lead generation ad model will be key to generating revenue off of mobile consumers. So What Could This Mean for Local Corp. (LOCM)?